Repeated exposure to minerals in your water makes blond hair brassy. To avoid the unmistakable yellow, yellow-orange hue in light blond hair, use our multi-tasking, heat-sealed haircolor. 12 Benefits™ violet blow-in balm temporarily neutralizes yellow tones and unwanted brassiness to keep your blond color looking vibrant between coloring. Great for mousey browns too! Instructions for use: Apply to damp hair where color is dull or faded. Layer in styling products or use alone. Blow dry. For a superior finish, seal dry hair with a hot tool (but not required). 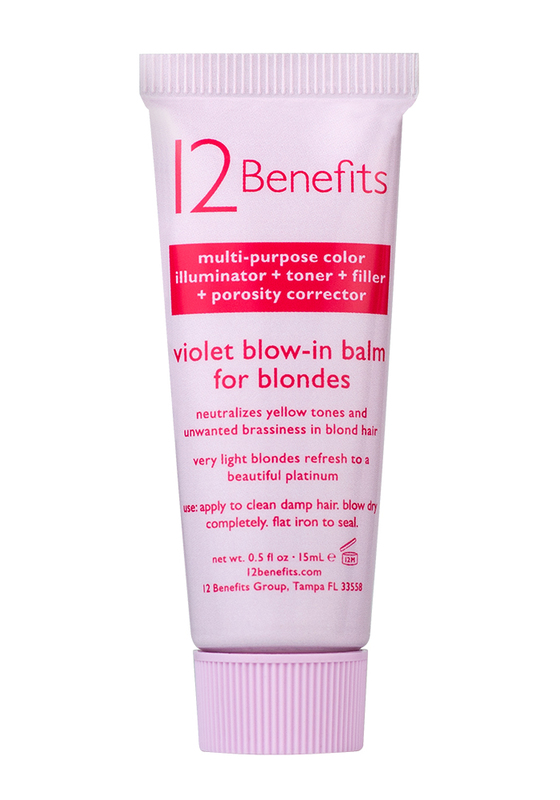 What will you experience using 12 Benefits™ violet blow-in balm for blondes? Good to know: Color correction should last 2-3 shampoos. Tube size should be enough for a 1-2 applications depending on hair length. You can also use as a color conditioner. Leave in 2-3 minutes and rinse. If your hair is porous (soaks in conditioner easily), apply 12 Benefits Instant Healthy Hair Treatment before you use Violet Blow-in Balm for Blondes.